Mt. Washington is located ~25 km. west of the city of Courtenay, British Columbia, in east central Vancouver Island. The property centre is lat 49.762320°N lon -125.307670°W. The property covers ~542.6 acres and currently consists of mineral tenures 1063802 and 1063803. The property is accessed by a mining road commencing at the back of the adjacent ski-hill parking lot, or via a mining road which is gated by Timberwest, who can provide the owner will a key with a completed gate application form, that includes a $500 deposit. Access to the property from nearby Courtenay or Comox is via Highway 19 north fom Comox Valley Parkway to Strathcona Parkway, west for 10 km. to Tsolum Main FSR. Domineer-Lakeview Zones - 550,298 tonnes @ 6.75 g/t gold, 32.23 g/t silver and 0.57% copper (Better Resources Ltd., 1989). Mt. Washington Pit Area - 305,720 tonnes @ 1.07% copper, and undocumented gold and silver contents (W.G. Stephenson, 1970). The Domineer-Lakeview-Mt. 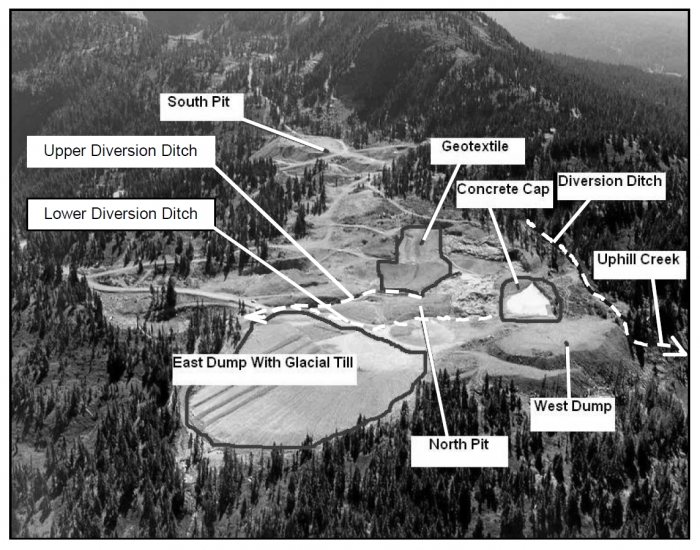 Washington Copper zones have been partially mined in two open pits, and have been explored by extensive surface diamond drilling, trenching and two underground adits from 1940 to the present by different companies. From 1964 to 1967, 381,773 tonnes were mined by the Mt. Washington Copper Co. Ltd., yielding 131 kg. gold, 7,235 kg. silver and 3,548 t. copper, grading 0.34 g/t gold, 19 g/t silver and 0.93% copper. Asking $250,000+2% Net Smelter Royalty, or best offer. Option/Joint venture may be possible. Warning- This property is offered for mining purposes only and ownership of the title to it does not include ownership of the surface rights or the right to use the surface for residential or recreational purposes.